In a christening ceremony, the ship sponsor is the central figure in an event that reaches far back in history. In ancient Greece, for example, participants in ship launchings drank wine to honor the gods and poured water on the new vessel as a blessing. In 17th-century England, the presiding official took a sip of wine from a ceremonial cup and poured the rest on the ship. The first description of a U.S. warship christening is that of Constitution, “Old Ironsides,” at Boston on Oct. 21, 1797. As the ship slipped into the water, the sponsor, Capt. James Sever, broke a bottle of Madeira over the bowsprit. The first identified female ship's sponsor was Miss Lavinia Fanning Watson, daughter of a prominent Philadelphian. She broke a bottle of wine and water over the bow of sloop-of-war Germantown at the Philadelphia Navy Yard on Aug. 22, 1846. Champagne came into popular use as a “christening fluid” in the late 19th century. A granddaughter of Navy Secretary Benjamin Tracy broke a bottle of champagne on the bow of Maine, the Navy’s first steel battleship, at the New York Navy Yard on Nov. 18, 1890. 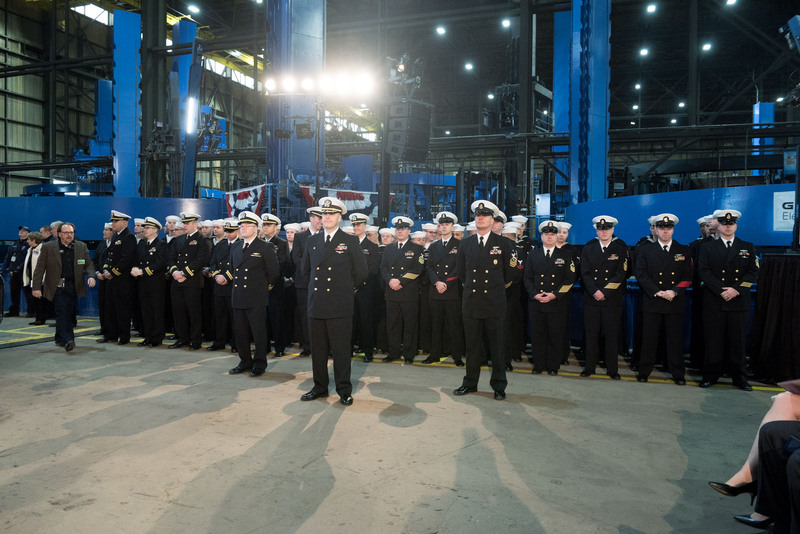 The crew of the submarine South Dakota at its keel laying April 4, 2016. 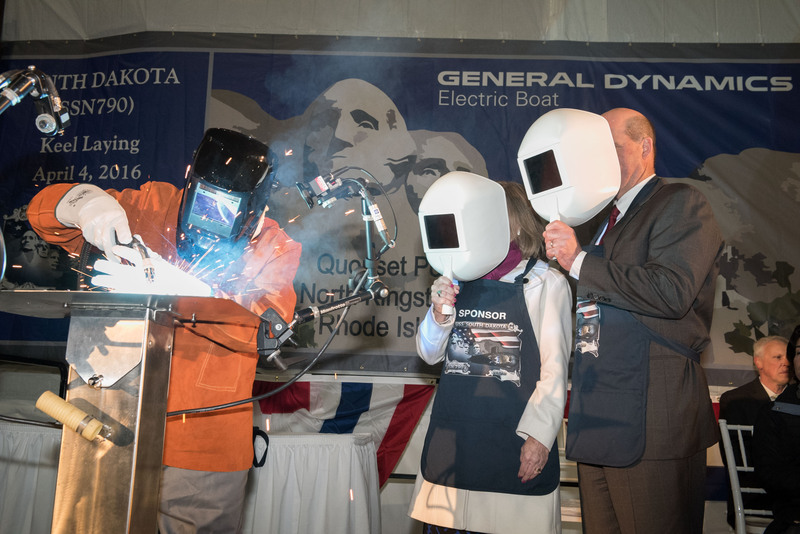 Electric Boat employee Dominico Castaldi welds the initials of Ship Sponsor Deanie Dempsey during the keel laying of the submarine South Dakota April 4, 2016 at Quonset Point. USS South Dakota (SSN-790) Christening Ceremony • October 14, 2017 Full Version from Powerstation Events on Vimeo.